Yet another Christmas approaches with the usual breaking of the agreement that the adults won't bother exchanging gifts. I've previously tried insisting that I really didn't want anything for Christmas from my parents (aside from watching DS1 opening his presents from his grandparents after the traditional huge family Christmas Eve dinner), but I always ended up getting "something" - usually an electronic knick-knack that I don't really want which then just clutters up the house for several years until it gets thrown out. 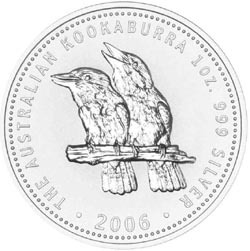 So, this year I decided I may as well prepare for the inevitable and ask for something that has an intrinsic value, I'll actually like, and won't take up too much space - silver coins. I already have a coin collection, so a few additions each year won't create any new storage problems. My mum had no idea how to order what I wanted, so I ordered them online and mum will pay me back (apparently adults don't need a Christmas present to be a surprise, but do need a wrapped up present to exchange). 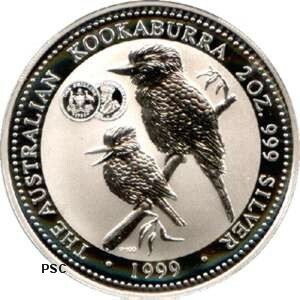 As my birthday is a couple of weeks before Christmas I ordered two items - a 2005 1oz costing $30 for my birthday present and a 1999 2 oz 99.9% Silver Kookaburra (Perth Mint Privy Mark, 1933 Shilling) coin costing $75 for Christmas. The silver content of these coins is worth about 50% of the cost, and the same 2oz proof coin is listed elsewhere and on ebay for $120, so I think it's a good buy at $75.